In 2018, against the backdrop of various challenges including the slowdown of global economic growth and regional trade disputes, the national economy continued to maintain a steady improving trend with the continuous upgrade of national consumption structure and the increase of domestic macro sports demand, resulting in booming development of the domestic sports market. During the year, the Group gave its best efforts in creating LI-NING's experience value to embrace the development opportunities in the sports market. By gradually executing its development strategies and implementing the relevant measures, it has constantly optimized various operational indicators and enhanced the brand image and brand value with satisfactory results. According to the statistics of the National Bureau of Statistics, China's Gross National Product (GNP) registered a year-on-year increase of 6.6% in 2018, the national disposable income per capita of urban and rural residents recorded a real increase of 6.5%, while Engel coefficient further decreased, reflecting further improvement of the national consumption structure in China. From the perspective of sports consumption, the domestic sports industry continued to grow rapidly with more refined and mature demand in the sports market. In recent years, with the growing demand for tournaments and events stemming from healthcare, entertainment and athletic competition, sports consumption witnessed a fundamental change from simple consumption for sports competition to consumption for sportsmanship, demonstrating huge potential of China's sports market in the future. According to the statistics of the General Administration of Sport of China, the number of people regularly participating in physical exercises in the country showed a rising trend and amounted to 550 million in 2017, up by approximately 25% as compared to 2016. During 2018, revenue of the Group maintained a stable growth with our profitability improving continuously. The profit attributable to equity holders increased from RMB520 million in 2017 to RMB720 million. During the year, we continued to optimise the retail business model with the goal of being "Precise + Swift". We also adopted a development strategy of "Single brand, Multi-categories, Diversified channels" with a view to creating and enhancing LI-NING's experience value. Our innate sports DNA has impelled us to place more emphasis on sports research and the investment in product research and development (R&D) and design to constantly launch professional products for athletes and sports enthusiasts. Creativity and imagination, on the other hand, is guiding LI-NING brand to be more trend-setting by integrating fashion, culture, entertainment and leisure elements with professional sports, therefore establishing our brand personality and providing consumers with more precise consumption experience. During the year, the brand also adequately demonstrated its product competitiveness through the International Fashion Week shows, thus gaining positive feedbacks and good reputation and further consolidating the brand's influence among consumers as well as the influence of domestic brands on the international stage. In 2018, the Group's various key operational indicators continued to improve. During the year, revenue of the Group grew by 18%, while the net profit margin rose from 5.8% last year to 6.8%. Cash flow from operating activities increased by 44% to RMB1,672 million. Meanwhile, working capital optimized steadily, with the Cash Conversion Cycle (CCC) shortened from 49 days in 2017 to 40 days in 2018. 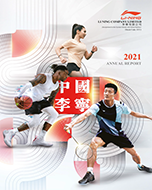 With improved confidence of distributors, in terms of tag price, trade fair orders for LI-NING brand products (excluding LI-NING YOUNG) from franchised distributors, which from the latest trade fair held in December 2018 for the third quarter of 2019 registered a low-teens growth on a year-on-year basis. Catering to the increasingly mature and refined consumption demand, during the year, we focused on the reform of products, channels and retail capability, and supply chain management and gradually established a business model that is more efficient, vitalized and retail-oriented, thereby enhancing and consolidating LI-NING's experience value in full swing. We also introduced new retail concept through digitalization strategy and enhanced the sales efficiency both online and offline. Meanwhile, we focused on enhancing product competitiveness and efficiency and continued to optimize the business model of LI-NING, thereby establishing a logistic supporting system that is in line with retail efficiency and effective operation, which has in turn enhanced the efficiency of sales channels, optimized the overall retail operation capability of the Company and enabled sustainable and steady business growth. During the year, the retail sell-through for the overall platform (including online and offline) increased by mid-teens (e-commerce registered a high-forties growth); while the same-store-sales registered a low-teens growth on a year-on-year basis. In terms of sales channel, we continued to seek breakthroughs in channel diversification by consistently promoting the execution and implementation of the strategy of high store productivity based on differentiated demand of various regions. We have also effectively rationalized our offline channels by closing and reforming low productivity and loss-making stores, which has in turned optimized the structure of sales channels and thus enhanced efficiency. Adhering to our tradition to make new attempts and breakthroughs in sports fashion concepts, we opened 23 China LI-NING casual stores during the year. We have conveyed the creative interpretation of LI-NING brand's sports fashion concept by creating these stores for modern and trendy shopping experience. For online sales, we continued to improve our data analysis and forecast system. Meanwhile, we have invested more resources in content marketing and event marketing, and enhanced our product competitiveness by offering diversified online experience in tandem with hot topics such as Tmall Day, New York Fashion Week, Paris Fashion Week, and specific offerings for e-commerce. At the same time, we have expanded our consumer base through online marketing and facilitated an omni-channel experience by integrating online and offline channels. During the year, we placed more emphasis on the professional sports attributes of our products, while constantly exploring rooms for integration of sports with fashion, leisure, culture and entertainment. By doing so, we have not only enhanced our product competitiveness, but also further consolidated the influence of LI-NING brand through marketing on multiple levels and dimension via the integration of professional competition resources and fashion trends. On the professional product level, we continued to accumulate and explore knowledge of sports during the year and applied more new technology and new materials to our products. We offered exclusive and highly professional experience to sports players, thereby enhancing LI-NING brand's competitiveness in mainstream mass sports in China. During the year, LI-NING brand first launched products under the top-notch running shoes series, "Wind Chaser" (追風) and "Battle Axe" (戰斧). The products under this series offer superior shock-absorbing function with the shock-absorbing technology of our self-developed LI-NING Cloud LITE adopted for midsole, and the shock-relieving technology of DRIVE FOAM used in the heel. On the other hand, we also conducted more communication and interaction with consumers, so as to create LI-NING's product experience and sports experience and thus enhancing brand experience. During the year, we organized the Ultra-light Vertical Running Activity for the "Super Light 15th" running shoes in Shanghai, during which we simultaneously launched online running activity via cross-sector collaboration with running APPs, which has attracted more than 100,000 participants and provided another close interactive experience for our end consumers. Meanwhile, we have captured consumer demand more precisely and enhanced the interaction with consumers and solidified the brand recognition among consumers by coordinating sports resources for tournament marketing at all levels, thereby consolidating our brand image in all domains. During the year, we integrated resources from tournaments and players such as China Basketball Association (CBA) Professional League. As a result, LI-NING brand and the underlying products firmly dominated China's most professional basketball leagues at all levels. Leveraging promotion by marathon sponsorship, and exposure in professional competitions, we have demonstrated the spirit of professionalism and breakthrough of LI-NING running shoes, at the same time assisting the athletes to achieve good results. In addition to developing professional products, we also proactively studied and sought ways to integrate professional products more closely with cultural life, including diversified marketing initiatives such as endorsements by famous players/leagues, KOL promotion in professional fields and exposure at Fashion Weeks. Furthermore, we organized product launching activities that are in line with our channel and product features, hence boosting sales and becoming a hot topic. During the year, we continued to cooperate with sports stars such as Dwyane Wade, a renowned NBA star, while delivering and integrating elements of their personality and lifestyle into the products and provided a diversified chic style for consumers. Consequently, the apparel products of WADE series achieved a sales performance of over 4.4 million pieces. Meanwhile, we focused on the trends amongst young consumers in order to keep up with the current fashion trend and topics. We have sparked discussion, attracted more attention from young consumers and increased our brand competitiveness through New York Fashion Week and Paris Fashion Week and the crossover collaboration with the DISNEY Company and BMW X2. During the year, we participated in New York Fashion Week with our "China LI-NING" (中國李寧) brand and "Essence" (悟道) product series and gained positive feedbacks while "Butterfly 2018" (蝴蝶2018) has become one of the hottest topics of New York Fashion Week. This has enhanced the perception and recognition in the international market of domestic brands and Chinese culture. In addition, we continued to pursue in-depth cooperation with fashion and trendy media to achieve effective communication with young consumers through the incorporation of entertainment elements. We have also explored the fan economy and increased the fashionable elements in our brand, providing consumers with more fashionable product choices. In 2018, we continued to improve various aspects such as diversified channel development, matrix display of store image and omni-channel operation to further optimize operation-supported platform and enhance retail capability. During the year, we continued to optimize product operation model with a view to responding accurately to market changes to meet terminal sales requirements. Meanwhile, we are committed to optimizing and enhancing omni-channel logistics supporting capacity, continuously enhancing the service capability to consumers and providing a fast and convenient shopping experience. For retail operation, we persisted on improving the retail operation-supported platform and adopted a shopping experience-oriented approach to enhance in-store sport experience and re-shape retail experience at stores constantly. Moreover, the Group continued to consolidate the commercial zone market analysis on the business structure at all market levels. Coupling this with the development of consumer group structure, we have optimized the overall matrix of our store images and categories. Meanwhile, catering to different sports product categories and city tiers, we also launched a differentiated market layout for product coverage. In addition, we attached great importance to refining the retail operation standards of stores. The refined standard procedures for all store categories have enabled the Group to improve and unify our store images. We have also improved the training system to provide integrated training both online and offline, and strengthened the training for terminal sales personnel and teambuilding of sport consultation team, thereby enhancing our staff's professional knowledge on products and customer service standards, which has in turn allowed us to offer customer with a fast and comfortable shopping experience. For our new businesses, with the enhancement of single store profitability remains our focus, we will carve out business opportunities and market potential by utilizing resources in a reasonable and prudent manner, thereby creating new business opportunities for the Company's development and profit growth in the long term. In the future, with continuous economic development and technology advancement, the consumer market environment will be more complicated and ever-changing. We will insist on devoting major resources into learning sports knowledge, research and development on sports technology and LI-NING brand experience development, striving to explore and broaden room for business development, strengthen our brand values and enhance LI-NING experience value so as to inject more vitality and creativity to the brand. As the founder and operator of the Company, I always highly regard the interests of investors, and cherish their care of LI-NING brand and unremitting supports to the Company. Meanwhile, I would like to express my sincere gratitude to our dedicated and hardworking staff. The management and I will spare no efforts to steer the Company forward towards further development in the future, forging a more professional and unique LI-NING brand in a new era. "Anything is Possible"!